Why Sailing for Women Only? Big arsed trousers or cockpit chic....just how much choice is there? How do you make the transition from one to the other? ...I know which I'm having! If you have a partner who sails, you know that there can only be one Captain on a boat! So even though you're equals in other aspects of your life, the minute you step on a boat together things become fraught & stressful as you struggle with the shift in dominance. Believe it or not, he is yearning for you become that competent, confident sailing partner; someone that he can hand over the night watch to on a long passage, and someone he can rely on to get the boat and crew home safely if things go pear shaped. Somehow you need to gain some skills in a stress free environment and very often it's better for you both to sail apart...for the sake of each other's sanity! One option is to swap partners with a fellow sailor...just for the sailing! The skippers learn to become calmer and more prescriptive in their commands, and the crew learn to trust the skipper's authority and capability. As you grow in your confidence & ability, ask for more responsibility until you are acting as skipper sailing trips or specific manoeuvres. Navigation and other boating skills are readily learned over the winter months in organised evening courses...check out your local adult education colleges to see what's around in your area. Do Some Women Only Sailing! A time spent aboard a women only boat takes the ego out of the equation when you're trying to practice new skills. After a time spent learning apart, you will find that you can spend time on a boat with your partner with a new respect for the Captain & Crew roles that are necessary for a great sailing relationship; only this time, perhaps you can share! Yes, that's right, the easiest/cheapest way to learn sailing is to find someone with a boat and get them to take you out on it! Even though most boat owners will be members of a sailing club, not all of them will participate regularly in the club activities so it pays to put a notice up on the board in your local marina. 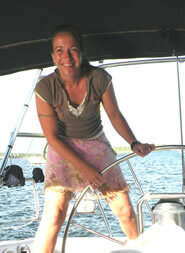 Most boat owners are very happy to have a new sailing companion and will gladly show you the ropes. If you're lucky, you may already have a Women's Sailing Club active in your local area, and they are sure to make you welcome; otherwise you can join one of those blokey ones. Although it can seem a bit daunting at first, the friends you've made hanging around in the marina will ease you through the initial introductions and you'll soon feel like one of the boys! Formal courses that are run under your National Sailing Association will help to consolidate what you've learned on OP's boats and give you a real boost of confidence. They can be quite intensive due to the need to complete a curriculum within the space of your course, and you may find that any boys on board take the lead in the more physical aspects which isn't really helping you. However, well run courses are generally a lot of fun and you should be able to find some Women Only courses available. Whilst I don't run formal sailing courses as an independent operator, I do provide on board tuition as part of the Ladies Only Sailing on IBIS. This is very much learning at your own pace as I don't need to follow a strict curriculum, but I am a qualified RYA Cruising Instructor, an ASA Basic Sailing Instructor and a CYA Basic Cruising Instructor too. As a fellow female sailor, and a pretty slight one at that! I've had to learn alternative techniques to brute force which I'm only too happy to pass on to you! You Don't Need to Be a Bruiser! OK, girls, here's what I say! I'm 5'3" and 55 kilos (most days), I'm not a feminist, but neither am I a poor little missey who needs help with the winching; I don't want to win regattas (in fact I don't have much of a competitive streak at all), I just like to be competent and capable and to know how to get the best out of my boat...without being too obsessive! Oh, and most of all, I just LOVE being out on the water. Women Often Don't Get a Look In! Whether you're a seasoned sailor or not, single or partnered, lets face facts, if you're on a boat with a bloke you tend not to get much of a look in....in anything...well perhaps the provisioning & the laundry! They don't really mean to keep us to one side, it's just that sailing's such a physical sport and they love to flex their muscles for you! Once you know how to sail , well, you can usually use your feminine wiles (yes, you know you have them!) to get your voice heard in the end, but for beginner sailors and particularly for shy single women, I haven't forgotten just how intimidating it can be trying to learn new skills in this mucho macho male dominated sailing world! The thing is, even if you're quite happy doing the washing up and making dinner on board, there may come a time when you absolutely HAVE to take control of the boat, in fact lives may depend on it. For this reason alone, you need to raise the bar on your skill level, to push your limits and to learn new techniques so that you have the confidence and the ability to do this if you need to. No-one's saying you need to be the next Ellen McArthur (unless you want to be) just be what you know you can be; a competent, confident, capable woman! 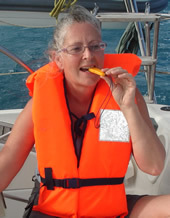 A women's sailing trip on IBIS in the Caribbean is great fun! As more and more women take to the water, some of the big sailing- wear brands are turning their attention to styling for the laydeez. With the choice beginning to widen we look at whether women's sailing clothes still leave you feeling like a shapeless blob.